July 3, 2016: The St. Louis LGBT History Project thanks Cameron Kinker for donating a copy of his undergraduate senior thesis. 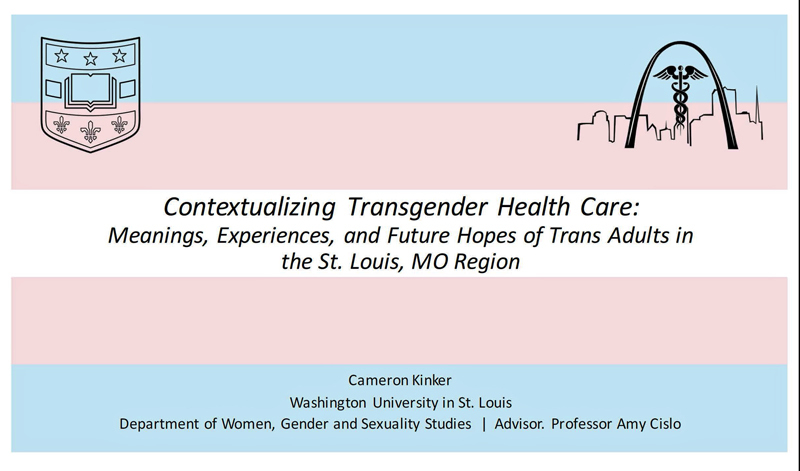 Kinler’s thesis is titled “Contextualizing Transgender Health Care: Meanings, Experiences, and Future Hopes of Trans Adults in the St. Louis, MO Region.” The thesis was based on interviews with fifteen transgender individuals and includes transcripts of these interviews. Kinker’s work offers an informative snapshot of what it is like to be trans in St. Louis today, and it is likely to become a valuable historical document in the years to come. Kinker was a student in the Department of Women, Gender, and Sexuality Studies at Washington University. He gradudated in May 2016. Do you have documents, objects, or photographs that help tell the story of the transgender community in the St. Louis region? Please consider sharing them with the St. Louis LGBT History Project. May 30, 2016: The Project is busy preparing for 2016 Pride events. Please plan to catch up with us at these various activities. Throughout the month, the Project will be posting updates about our latest research and unveiling some amazing new donated artifacts. Saturday, June 4, 1 pm. Free historic walking tour of the Central West End. RSVP for directions and more information. Thursday, June 9, 7 pm. Steven Louis Brawley will discuss his new book Gay and Lesbian St. Louis at the Missouri History Musuem. Saturday, June 18. The Project will offer a display at this year's St. Charles Pride. Saturday, June 25. The Project will offer a display at Tower Grove Pride. Sunday, June 26. The Project will offer a series of presentations at this year's St. Louis Pride. at 2:30 pm by the Library. NOTE: The Project will not have an exhibit this year due to construction at Soliders Memorial. During June: LGBT history exhibit at Olin Library, Washington University campus. Donate: Celebrate Pride by making a donation to support the Project. Thanks. April 12, 2016: One year ago, after consulting with the women who run the Old Lesbian Oral Herstory Project (OLOHP), we began an oral history project to document Betty Neeley's life story. OLOHP began in 1997 when Arden Eversmeyer started working with women she knew who were ill and dying in Houston, Texas. She then began collecting stories from friends in Texas and across the nation. And now, she and others are working to collect the life stories from lesbians age 70 and older wherever they are found, and whenever they are willing to share them. The project provides digital recorders and over the course of the spring and summer of 2015, myself and others conducted multiple interviews with Betty. Present for our four interviews with Betty were Carol Seithel, Carolyn Niethe, Donna Welling and Betty's partner, Cindy Walsh. Each interview was loaded on to a computer and sent to OLOHP. These digital recordings were then turned over to OLOHP's professional transcribers. We received a copy of the transcript and reviewed for accuracy and errors. We also provided footnotes on several important memories. We digitally scanned a number of Betty's photos and memorabilia to send to the Project team. 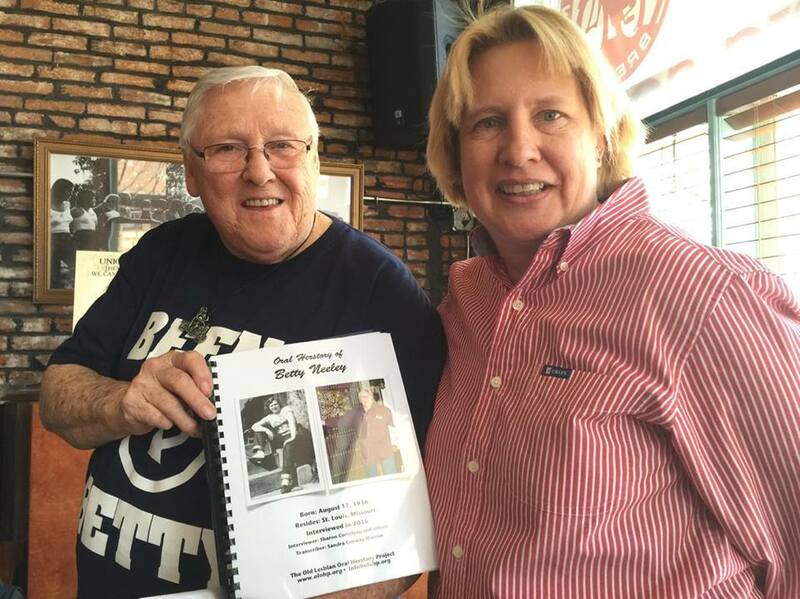 The final product, a nicely bound book, was presented to Betty on April 3, 2016 at Lilly's Music and Social House during a special "Herstory Brunch." Copies will also go to the Archives at Smith College, OLOHP, and the St. Louis LGBT History Project. Thanks to everyone for making this happen. 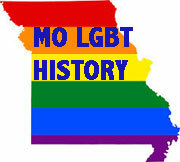 We are planning to conduct additional St. Louis lesbian oral histories in the near future. Stay tuned. 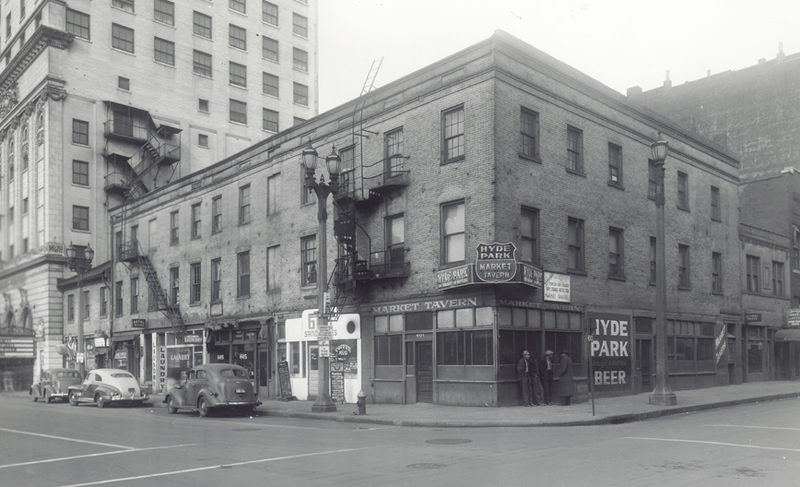 April 8, 2016: The St. Louis LGBT History Project recently identified photographs of three early LGBTQ-oriented bars. Dating to the 1940s and 1950s, these are among the oldest images we have found of St. Louis-area LGBTQ drinking establishments. The images were discovered in the Missouri History Museum's collection of historical photographs of St. Louis streets scenes. The special significance of these photos seems to have previously gone unrecognized. The first photo (above), dated 1941, is of the Market Tavern. It was located at 601 Market Street, now on the site of Kiener Plaza near the Old Courthouse. This nightclub was in business from mid-1930s (shortly after the repeal of Prohibition) to the early 1940s. While it was definitely a "queer space" (to use a modern phrase), Market Tavern might not have a "gay bar" in the sense that its clientele was predominantly LGBTQ. The Market Tavern hosted performances by "female impersonators"—what we would now normally call "drag queens." During the 1930s, a nationwide fad called the "Pansy Craze" briefly popularized "female impersonation" and other forms of risqué, gender-bending entertainment. In New York, Chicago, and other cities, many "normal" people visited nightclubs that specialized in these types of acts. The Market Tavern seems to have been a St. Louis-area example of the "Pansy Craze." 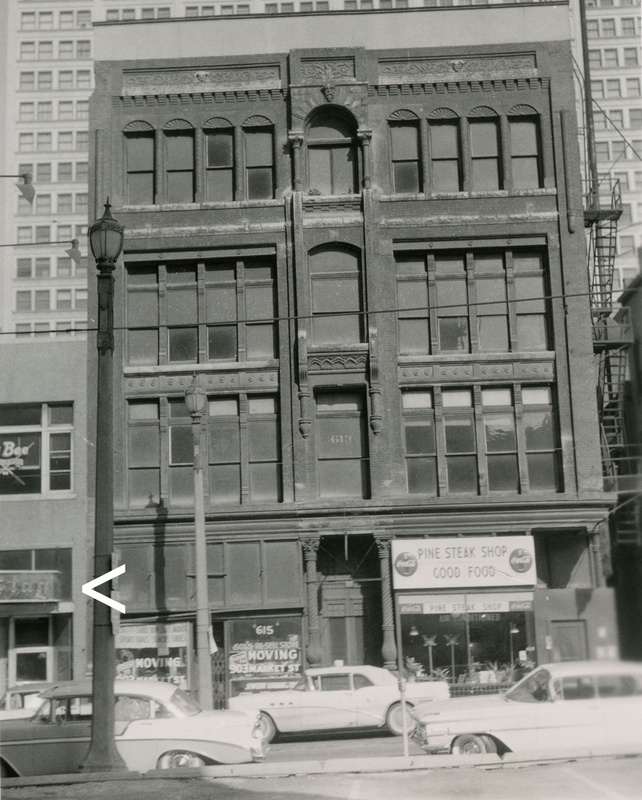 St. Louis LGBT History Project researchers are in the process of accessing police and court records that might help us learn more about the Market Tavern and the "female impersonators" who worked there. The second photograph (see arrow above), taken in about 1946, shows the exterior of Uncle John's tavern. On the right side of the photo, you can make out a sign reading "Uncle John's" beneath an advertisement for Budweiser beer. Part of another bar, the Entre Nous tavern, can be seen in the far left of the third photograph (see arrow above). This photo appears to have been taken in the late 1950s. The entrance to the Entre Nous can be seen beneath an advertisement for Stag beer. The first floor of the building was occupied by the bar; the second floor was taken up by Busy Bee Billiards. 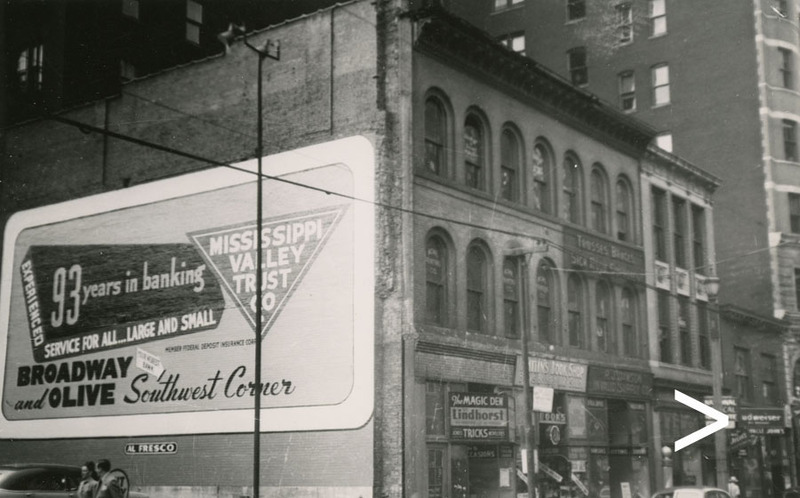 In business for a number of years in the 1940s and 1950s, Uncle John's and the Entre Nous were located nearly across the street from each other on the 600 block of Pine Street in downtown St. Louis. The buildings where the bars were located have since been demolished and replaced with parking garages. Uncle John's and the Entre Nous seem to have mostly attracted men who were sexually interested in other men. Because the two bars catered to this clientele of "degenerates," they both drew the attention of the St. Louis police, who sometimes raided the bars and arrested their customers and employees. Last year, the St. Louis LGBT History Project uncovered police reports documenting one of these raids. The reports, which offer a fascinating glimpse at LGBTQ nightlife in St. Louis in the 1950s, were the subject of another article published on the Project's website. The Project is continuing its efforts to reconstruct the history of St. Louis's early LGBTQ-oriented bars which also include Dante's Inferno, Martin's, and Madame Touhy's. Look forward to future posts about these bars and their owners, customers, and troubled relationship with the police.